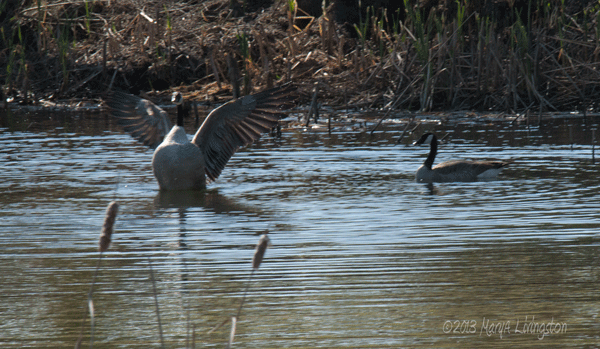 This entry was posted in Bliss Tips, My Backyard, Nature, Photography and tagged Canada geese, geese, nature, photography, spring, wildlife by MaryALivingston. Bookmark the permalink. Gorgeous capture, Mary. I love those Canada geese. how fun! congratulations that spring has arrived! Oh I’m just yearning for geese to be here. Some people have heard them this year but not me. Next week there will be hundreds. Beautiful photo, Happy spring! Canadian geese are lovely birds, sadly there are far too many of them, and their poo’s are killing some of our parks. Hunting provides a good balance. Not in Canada, Canadian Geese are protected. Oh, so the balance is missing. I know it sounds insensitive, but do they have a predator to take the place of people? Predator species keep populations in check, sometimes we forget our role. Sadly no predator to keep them in check. My father was a hunter, and I have my hunting license though I haven’t hunted for years. Hunting is fine as long as you are hunting for food and not for fun, thus wasting the bird or animal. She seems to be acting all cool like .